He was born in Prague, Czechoslovakia. At 15 he was sent to a ghetto. At 16 he was sent to Auschwitz, Mauthausen and survived the Nazi death march. He immigrated to Israel at 18 and survived 7 wars in Israel. He lost his first wife in his 40’s. He lost his second wife in his early 80’s. Today, Rav Sinai Adler is in his 90’s. He has over 300 direct descendants. He has thousands of students. I am just one of them. I study with him every Tuesday morning. This morning I came to the house and knew he’d want to vote and couldn’t get there alone. 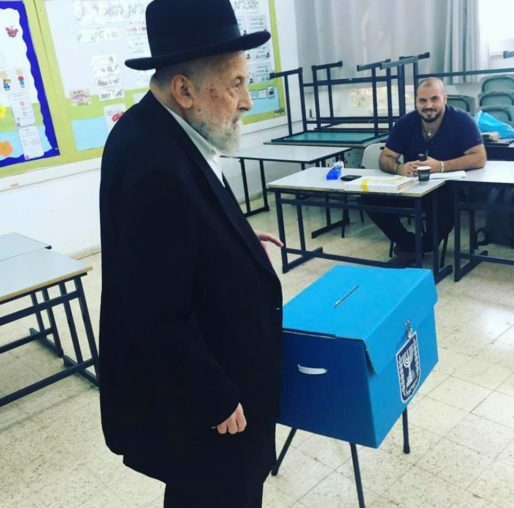 After I asked him if I could take him to the polling station, he said I was going to ask but I didn’t want to trouble you. For all you Nazis, antisemites, haters of Israel, look carefully. You lost. We won. PREVIOUS POST Previous post: Meet Julia Wallach.